Horseshoe worms (or Phoronids) are a small group of marine worms. There are only around 20 species known. They occur at in all oceans and seas (except the polar seas) and are usually found at depthsup to 70 metresr with some found at aup to 400 metres in depth. 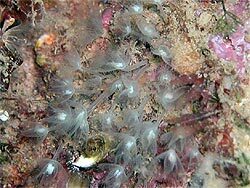 The adults are tube worms, and produce tubes made from chitin in which to live. These tubes can be buried in the mud or sand or can be resting on the surface of a rocky substrate. in this case they tend to live in colonies and their tubes become twisted around each other for support to form a large impenetrable mass. Some species can dissolve away holes in rocks such as limestone, calcareous seashells or even cement piers; they then live in these holes which they line with their secreted tubes. They are bullet-shaped with a thin, soft body up to 50 cm long. They have a ring of tentacles along their posterior boundary. They have a U-shaped digestive tract - the gut loops and ends close to the mouth instead of passing straight through the body. Phoronids are suspension-feeders. Food particles in the water current are trapped in a stream of mucous that travels along the tentacles until it reaches the oral ring from where it is drawn into the mouth and then on into the digestive tract. Phoronids are hermaphrodities or male or female, and they can also reproduce asexually. Fertilisation is most probably internal. Some species lay only small numbers (12 – 25) of large eggs which have a lot of yolk. These eggs are brooded within the adult's tube and they are released only when they have hatched. Other species lay a much larger number (up to 500) of smaller eggs. These eggs are released as soon as they are fertilised. They hatch a few days later into what is called an 'actinotrocha' larvae. The larvae develop over 2–3 weeks and settle after about 20 days. Metamorphosis takes place in less than 30 minutes leading to a slender young phoronid.